Border Reiver was nearly 6 months ago and yet I still hadn't got round to finishing off the miniatures that I got on that day. However Mr Panzerkaput then added an entry to his blog that described his recent visit to Reiver Castings. 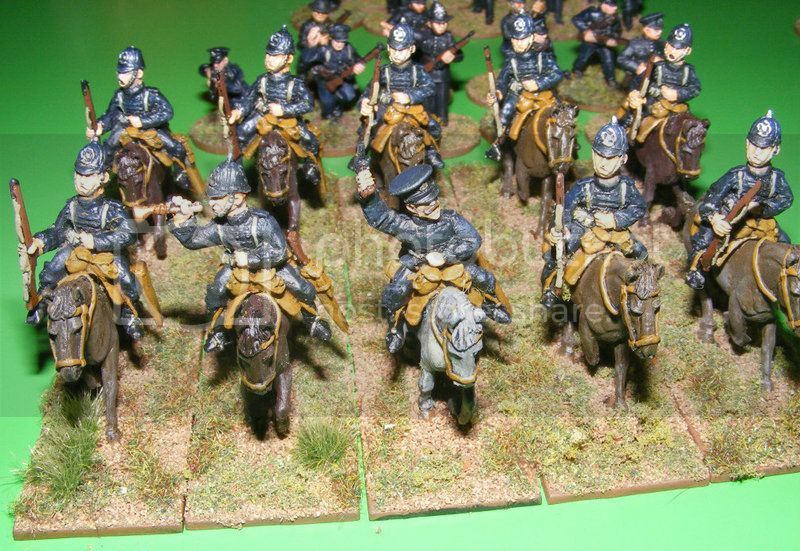 This great feature made me feel a little guilty that I was getting excited about new releases from Reiver when I still had 11 cavalry sitting on my desk, undercoated but going nowhere. I then also remembered that I had some of Musketeer's excellent RIC figures waiting to be painted as well. At this point there was no further problem deciding what to do on Saturday evening! 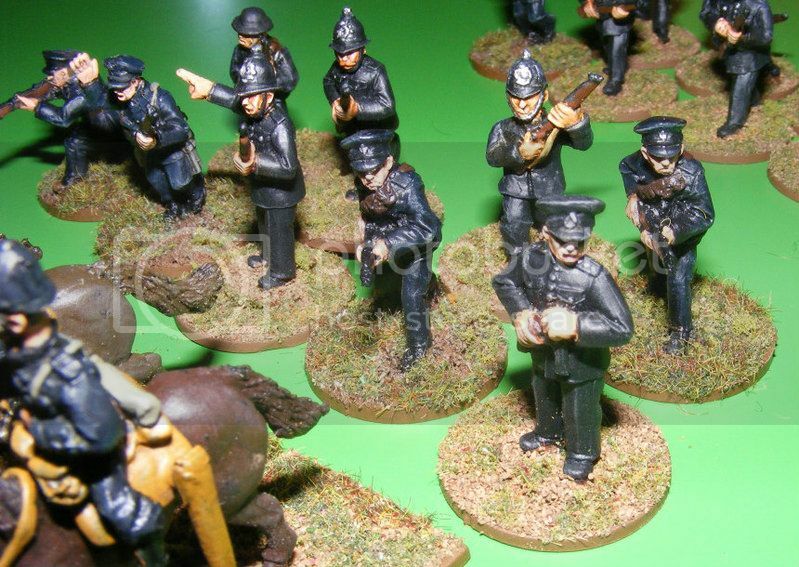 So here's the newly extended Police force from my 1938 VBCW collection. 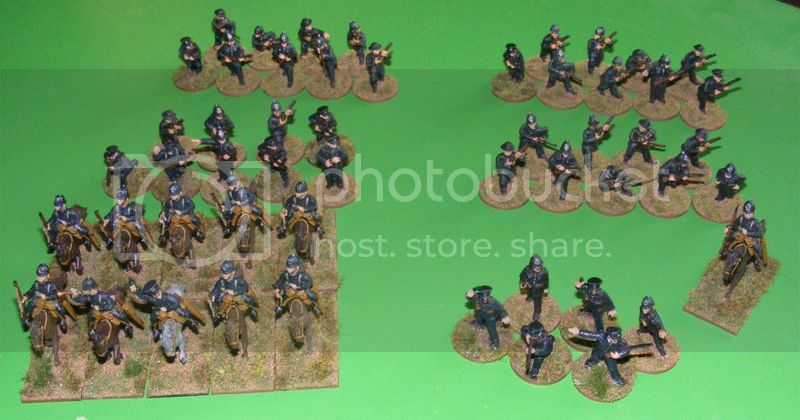 I will be adding 4 more Constables with rifles when I make my next Musketeer or Artizan order so that the force will be 4 sections of 10 infantry, 10 cavalry, mounted sharpshooter and the command group. I'm on the lookout for a suitable vehicle or two but simply haven't found anything that I like yet. I've deliberatly stayed clear of any automatic weapons; it's rifles and pistols only for my Police. I love the fact that our Police are not armed and feel that they would be unlikely to tool themselves up with heavy weaponry, I see them still relying on truncheons and handcuffs whenever possible. Enough rambling, here they are. Oh and no I didn't do "on duty bands" as after many many attempts I simply couldn't get them to look right. I can't remember where I got this idea from but it works rather well. I am sure that many of you also have the occasional problem with paint that has separated a little and doesn't get better, even if you shake it for ages. This simple idea can help out. Get some little glass or metal beads and add them to the paint. 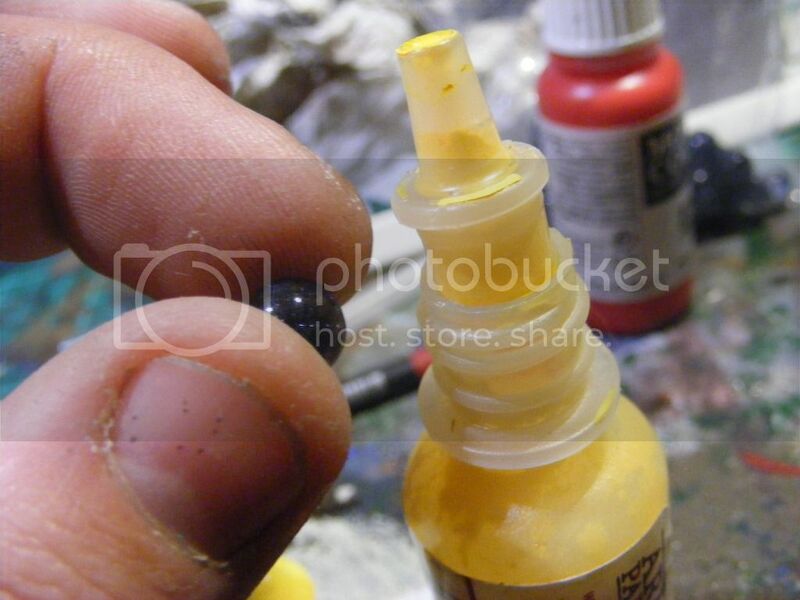 It's fairly easy to lift the top off a vallejo paint and pop it in. From then on when you shake the paint it will act like the noisy rattle thingamejig in a spray can!